Woodland Hills, Calif. – More than 200 family, friends, Cal State University Northridge President Dr. Dianne Harrison and avid supporters of Matador Athletics honored the newest members of the CSUN Hall of Fame in an emotional luncheon Sunday afternoon at the Warner Center Marriott Hotel. Cliff Abel (legendary men’s track & field head coach), Markus Carr (basketball), Lisa Erickson (softball) and Tereza Simonyan (tennis) are the 2014 inductees into the prestigious Matador Hall of Fame. The 2014 Hall of Fame class joins an elite group of more than 220 student-athletes, former administrators, coaches and three teams representing the 19 sports into the Cal State Northridge Hall of Fame. The Matador Hall of Fame was established in 1981 to recognize the men, women and Matador teams who distinguished themselves in athletics, either by sport or by meritorious efforts on behalf of athletics while an undergraduate or in years after leaving the University. Dr. Harrison, an avid supporter of CSUN Athletics, summarized the importance of the event as the first speaker during Sunday’s ceremonies. Dr. Brandon Martin, CSUN’s Director of Intercollegiate Athletics, echoed Dr. Harrison’s remarks. Cliff Abel served as the men’s track & field head coach at Cal State Northridge from 1971-76. In 1975, the Matadors won the NCAA Division II men’s national championship in Sacramento. That year, seven Matadors became All-Americans including Ed Chaidez, who won the six-mile run at the NCAA’s, and Steve Albright, who won the national title in the shot put. More than 65 Top-10 performances from Abel’s years as head coach (1971-76) remain in the CSUN track & field record book. Abel, the founder of the Northridge Relays, was named the National Coach of the Year in 1975 by the NCAA Division II National Coaches Association. Abel coached CSUN to four NCAA Top-5 national finishes. In addition to the NCAA championship in 1975, CSUN finished third in 1976, and fourth in 1974. Markus Carr is considered the greatest point-guard in the history of Matador basketball. Carrhelped the Matadors to its first appearance in the NCAA Tournament as an NCAA Division I member during the 2000-01 season (22-10). Carr played four seasons at CSUN (1998-02) where his name is heavily peppered throughout the Matador basketball record book. In fact, Carr’s name appears in the CSUN record book 34 times. Carr holds the CSUN career assists mark (767). He also ranks first in single season assists (286), and set a school record for single game assists with 15 against Wyoming in 2000, and Montana in 2001. Lisa Erickson is one of the all-time great softball players in Matador history. She played at CSUN from 1987-90. Erickson gained All-American honors twice (1989, 1990), and was a member of the 1987 NCAA Division II national championship team. Twenty-four years after graduating from CSUN in 1990, Erickson still holds a total of eight school career, single season and single game records. Most of those records may never be broken. The records include career batting average (.410), career runs scored (170), career hits (293) and career stolen bases (117). No one quarrels with Tereza Simonyan’s accomplishments as the greatest women’s tennis player in CSUN history. Simonyan holds four career and single season school records. The records include career wins (78 from 200-03) and single seasons wins (23 in 2001). Her name appears in the CSUN Top-10 list 12 times. 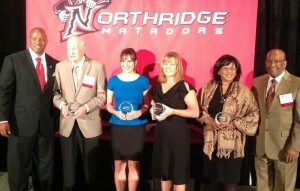 Serving as presenters for the four CSUN Hall of Fame inductees were former assistant track & field coach Chris Johnson (for Cliff Abel), Lance Erickson (the father of Lisa Erickson), women’s head tennis coach Gary Victor (for Tereza Simonyan), and Beverly and Joe Austin (the aunt and uncle of Markus Carr). 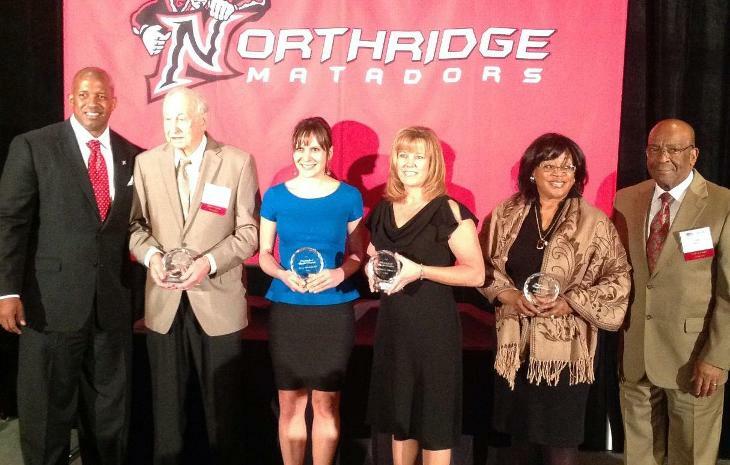 Congratulations to the 2014 Inductees into the Cal State Northridge Hall of Fame … Go Matadors !! !